Kellogg Community College’s Student Life office will celebrate diversity during Black History Month by offering traditionally African-American foods during a Soul Food Luncheon. The event, which is open to the public as well as to KCC students, will run from 11 a.m. to 1 p.m. Thursday, Feb. 13, in the Kellogg Room on the College’s North Avenue campus, 450 North Ave., Battle Creek. Tickets are $5 for KCC students with a current KCC ID and $10 for nonstudents. The menu will include traditional soul food items like fried chicken, collard greens, candied yams, cornbread, jambalaya, ribs, baked macaroni and cheese, pound cake and pecan pie. 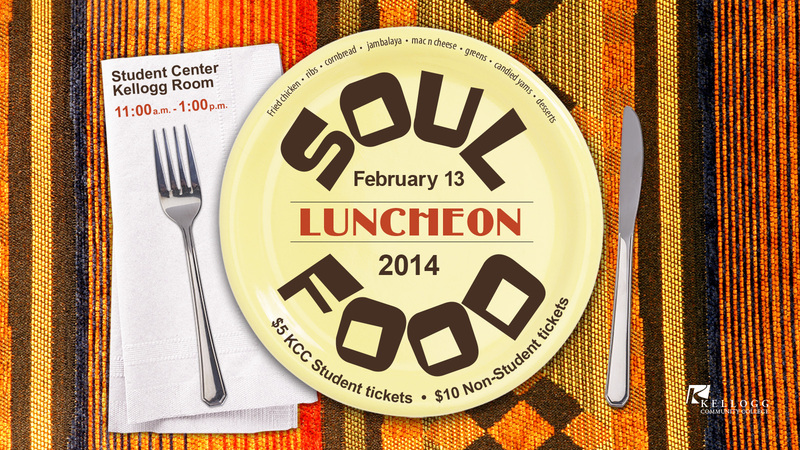 Most recipes will be provided and prepared by KCC employees; Laura’s Gourmet Catering, which provides food service at KCC, will prepare the pecan pie and sweet tea, while Coop de Grille, 903 North Ave., will provide the collard greens and cornbread. TaNisha Parker, manager of Student Life at KCC, said soul food is an important part of African-American culture and history. “This event is an opportunity for faculty, staff, students and the community to fellowship, learn and embrace the culture of soul food and African-Americans,” Parker said. Tickets for the event are limited and available on a first-come, first-served basis. They can be picked up at the Student Life office on campus. For more information, contact KCC’s Student Life office at 269-565-2634 or studentlife@kellogg.edu.